Oakland metal mainstays Machine Head recently cancelled their fall tour to put more work into their upcoming Bloodstone & Diamonds. The move has dug up something precious for fans, who are now being treated to a stream of lengthy album cut "Now We Die." Starting things off are the symphonic sounds of a string quartet, bowing their way through a spirited melody before Rob Flynn and the rest of his crew drop us into a vicious vortex of coal-black guitar chords and crushed grooves. Both the orchestral arrangement and the more metal-minded mannerisms of Machine Head are then laced together seamlessly, making for an epic merging mournful melodies with inspirational lines aspiring to "cast off the shackles of the past" and journey towards a better tomorrow. 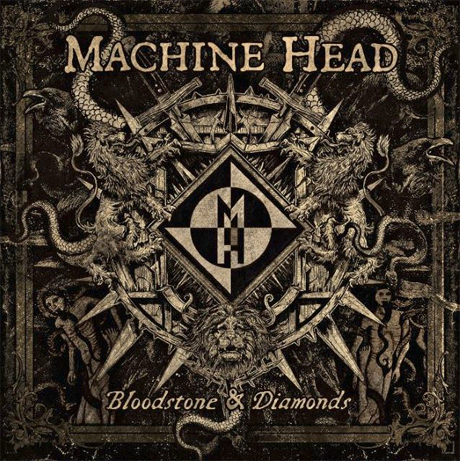 With that in mind, Machine Head's Bloodstone & Diamonds is ready to be unearthed November 10 through Nuclear Blast.